Difference Between Fixed, Variable Voltage and Wattage? Home Page | blog | Difference Between Fixed Voltage, Variable Voltage and Wattage? Difference Between Fixed Voltage, Variable Voltage and Wattage? You may of seen these products or heard people talking about variable voltage and variable wattage batteries and electronic cigarettes and wondered what is the difference? How are they different from what I’m using now? Why use variable voltage at all? It all comes down to power and how that effects the performance of your device. The power of your electronic cigarette (P) is determined by the voltage of your battery (V) and the resistance of the clearomizer head or coil (R). The resulting power or wattage is the amount that runs through your clearomizer head or coil. A higher power will mean the coil heats up more which will result in more liquid being vaporised giving you thicker vapour and a bigger hit. It can also change the flavour perceived. When you started with electronic cigarettes you most likely purchased a electronic cigarette starter kit like the CigElectric GO or CigElectric PRO. These batteries are known as “fixed voltage” as they output a fixed, constant voltage. The power of these e-cigs are then a result of that fixed voltage combined with the resistance of the atomizer head or coil you choose to use. Using a clearomizer with 1.5ohm resistance with a fixed voltage battery which outputs 3.5-3.7V you end up with a power of 8-9 watts. By using a lower or higher resistance head or coil the power will be higher or lower respectively. We find 8-9 watts is a nice amount of power for these devices and is why it is generally recommended to use a lower resistance head for a fixed voltage battery. Some more advanced batteries like the CLK, VV3.0 and MVP have micro chips inside them which allow you to set the voltage that the device outputs. This means, for a specific resistance of your atomizer head you can control the power going through the coil thus controlling the vapour production and flavour. If you crank up the voltage too high and the power is vapourising more liquid than can be feed by the wicks into the device you will start to get a burnt taste. 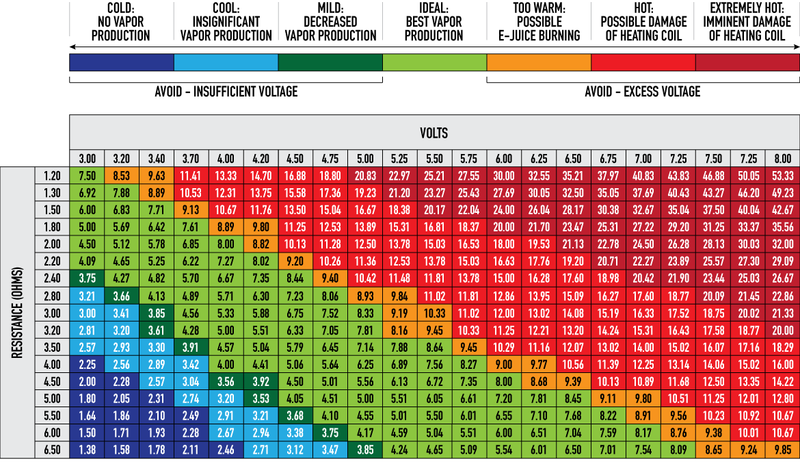 This means you need to reduce the voltage slightly to match how fast the liquid is being drawn into the atomizer head. If the voltage is set to low the vapour might seem weak and the flavour not very strong. This means you need to increase your voltage setting. Between these two extremes you have a range of voltages that will give you a different vapour and flavour. The beauty of these variable voltage and variable wattage devices is that you can customize the settings to find your “sweet spot”. Everyone’s tastes and preferences are different but with a bit of experimentation you can find the perfect settings that work for you. What Resistance Head or Coil Should I Use on my Electronic Cigarette Battery? It is generally recommended to use a higher resistance with variable voltage devices as it allow for a higher resolution of settings. A change of 0.1V will increase the power more on a lower resistance coil than on a higher resistance coil. So using a higher resistance will give more precision and accuracy when changing voltages. For fixed voltage batteries it is recommended to use a lower resistance coil to get a higher amount of power. What is the Difference Between Variable Voltage and Variable Wattage? Some more advanced devices like the iTaste MVP not only allow you to control the voltage but also the wattage. The way of thinking about this is variable wattage is like automatic mode. The voltage and resistance will give you your wattage. But by setting the wattage your battery will automatically adjust the voltage depending on the resistance of the device to keep outputting the same amount of power no matter what resistance you use or if the resistance of your coil changes over time. This means instead of having to adjust your voltage to match your resistance, you can just set your preferred wattage and your battery will adjust to what ever resistance you attach to it, effectively putting the battery in autopilot. 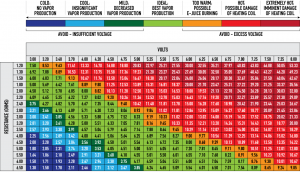 How do I know what voltage or wattage to set for my electronic cigarette? The voltage / wattage you want to use will depend on your clearomizer, its resistance, the juice you are using and personal preference. Using this chart will give you a indication of a good starting point and the upper and lower limits depending on your resistance. What is the Best Variable Voltage Electronic Cigarette for a Beginner to Get Started With? If you are looking for a variable voltage device that is really easy and simple to use you cant go wrong with the CigElectric PRO VV Starter Kit. This kit bundles everything you would get from a normal starter kit and includes upgraded variable voltage batteries. These batteries look and work just like the normal fixed voltage ones. the only difference is a very small spinner dial on the bottom which allows you to set your preferred voltage. For your first variable voltage device you cant go wrong with this starter kit, it gives you everything you need, even the e-liquid!